The days are getting shorter and the nights are getting crisper, but that doesn’t mean summertime is over here on Aquidneck Island. Make the most of the last week before labor day! We’ve rounded up some of the best and unique activities on this incredible island. Every Thursday, Newport Film hosts outdoor documentaries in gorgeous venues across the island! These events are free, with a suggested donation of $5. They provide popcorn and water, and there are food vendors. Enjoy live music before the film. Picnics are encouraged! A few weeks ago, I saw Studio 54 on the lawn of Rosecliff, overlooking the Atlantic Ocean and the Cliff Walk. The setting was almost as dazzling as the film itself. Bethany Hamilton: Unstoppable is playing at Second Beach Parking Lot in Middletown on August 30. Finding 52 is playing at King Park in Newport on September 6. The Cliff Walk spans 3.5 miles along the coast, and divides your attention between the sparkling Atlantic and Gilded Age mansions. The Cliff Walk was the first National Recreational Trail in New England. You can even climb down the ancient rocks to perch among the diving cormorants. Even if you just stay on the path, the Cliff Walk is an exceptional vista that never gets old. It does get cold though, so get there as soon as you can! Del’s Frozen Lemonade is a Rhode Island staple that’s hard to avoid on Aquidneck Island. Summer doesn’t start or end without a big cup of Del’s, and you can find trucks at the beach, at festivals, or at their stores on West Main in Middletown and Thames St. in downtown Newport. If you’re looking to responsibly enjoy Del’s with a kick, they partnered with Narragansett to create a lemon shandy and a cherry shandy. Newport’s annual Kite Festival may have passed (second weekend in July, put it in your calendar for next summer!) but that doesn’t mean kite season is over! Kites are truly fun for all ages, and Brenton Point State Park on Ocean Drive is the perfect setting. Ample wind and gorgeous view make for a great flight for your kite. 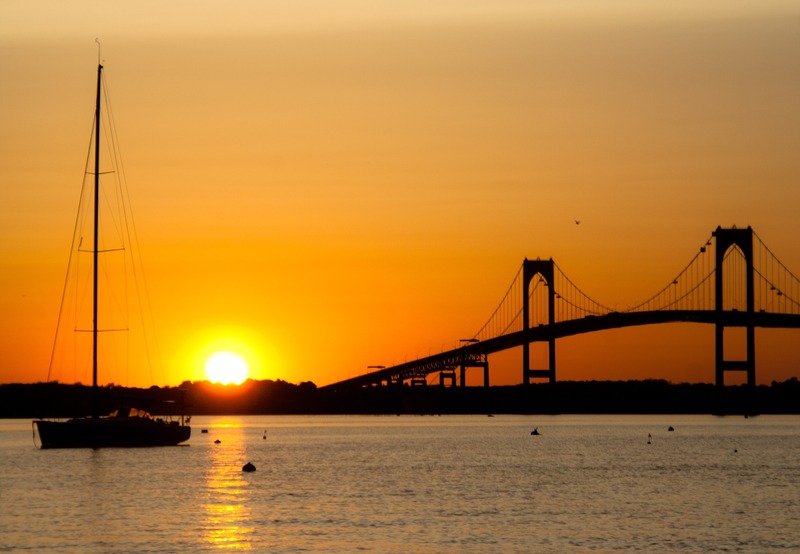 No matter what season, Aquidneck Island is a beautiful and welcoming place, but everything is better in the sunshine so go make the most of the season!